An aurora is a natural display of glowing light in the night sky, mainly in zones around the magnetic north and south poles of the Earth and some other planets. The light may be seen in various colors—such as violet, blue, green, yellow, and red—and it may take different shapes, including streamers, arches, and curtains. Some scientists call this phenomenon "aurora polaris" (or polar aurora). In northern latitudes, it is known as aurora borealis or northern lights, and the southern counterpart is called aurora australis or southern lights. The term aurora borealis combines the name Aurora, the Roman goddess of the dawn, with the word Boreas, the Greek name for north wind. It most often occurs from September to October and from March to April. 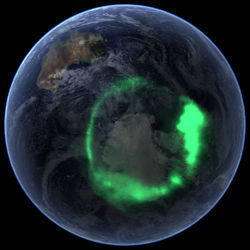 Aurora australis (September 11, 2005) as captured by NASA's IMAGE satellite, digitally overlaid onto the "Blue Marble" composite image. 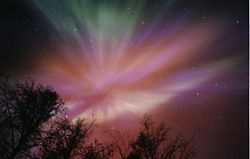 Typically, an aurora appears as either a diffuse glow or "curtains" that extend approximately in the east-west direction. 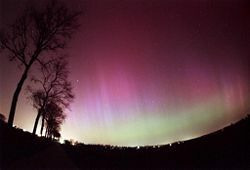 At times, one may observe "quiet arcs"; at others, one sees the patterns changing continually, known as "active aurora." Each curtain consists of many parallel rays, each lined up with the local direction of the magnetic field lines, suggesting that the aurora is shaped by the Earth's magnetic field. Indeed, satellites show auroral electrons to be guided by magnetic field lines, spiraling around them while moving earthward. The curtains often show folds called "striations." When the field line guiding a bright auroral patch leads to a point directly above the observer, the aurora may appear as a "corona" of diverging rays—an effect of perspective. In 1741, Olof Hiorter (1696-1750) and Anders Celsius (1701-1744) first noticed other evidence of large magnetic fluctuations that occurred whenever the aurora was observed overhead. It was later realized that large electric currents were associated with the aurora, flowing in the region where auroral light originated. Kristian Birkeland (1867-1917) deduced that the currents flowed in the east-west directions along the auroral arc, and such currents were later named "auroral electrojets." Still more evidence for a magnetic connection are the statistics of auroral observations. Elias Loomis (1811-1889) and later in more detail Hermann Fritz (1810-1882) established that the aurora appeared mainly in the "auroral zone," a ring-shaped region with a radius of approximately 2500 kilometers (km) around the magnetic pole (not geographic pole) of the Earth. It was hardly ever seen near that pole itself. The instantaneous distribution of auroras is slightly different, centered about 3-5 degrees nightward of the magnetic pole, and auroral arcs reach farthest toward the equator around midnight. To understand the formation of auroras, it is important to understand the interactions between the solar wind, the Earth's magnetic field, and the interplanetary magnetic field (IMF). The Earth's magnetosphere is the region in space shaped primarily by these interactions. The magnetosphere contains a mix of free ions and electrons held mainly by magnetic and electric forces. The boundary of the magnetosphere is called the magnetopause. The Earth is constantly immersed in the solar wind, a rarefied flow of hot plasma (gas of free electrons and positive ions) emitted by the Sun in all directions, a result of the million-degree heat of the sun's outermost layer, the solar corona. The solar wind usually reaches Earth with a velocity around 400 km/s, density around 5 ions/cc and magnetic field intensity around 2–5 nT (nanoteslas; the earth's surface field is typically 30,000–50,000 nT). These are typical values. During magnetic storms, in particular, flows can be several times faster; the IMF may also be much stronger. The IMF originates from the Sun and extends into space, penetrating the regions between the planets of the Solar System. It is related to the field of sunspots and its field lines (lines of force) are dragged out by the solar wind. That alone would tend to line them up in the Sun-Earth direction, but the rotation of the Sun skews them (at Earth) by about 45 degrees, so that field lines passing Earth may actually start near the western edge of the visible Sun. The Earth's magnetosphere is the space region dominated by its magnetic field. It forms an obstacle in the path of the solar wind, causing it to be diverted around it. The width of the magnetospheric obstacle, in the direction facing the Sun, is typically about 90,000 km; and on the night side, a long "magnetotail" of stretched field lines extends to much greater distances. When the solar wind is perturbed, it easily transfers energy and material into the magnetosphere. The electrons and ions in the magnetosphere that are thus energized move along the magnetic field lines to the polar regions of the atmosphere and cause the aurora. The aurora is a common occurrence in the ring-shaped auroral zone mentioned above. It is occasionally seen in temperate latitudes, when a strong magnetic storm temporarily expands the auroral distribution. Large magnetic storms are most common during the peak of the eleven-year sunspot cycle or during the three years after that peak. However, within the auroral zone, the likelihood of an aurora occurring depends significantly on the slant of the IMF lines, being greater with southward slants. Geomagnetic storms that ignite auroras actually happen more often during the months around the equinoxes. It is not well understood why geomagnetic storms are tied to the Earth's seasons when polar activity is not. It is known, however, that during spring and autumn, the Earth's magnetic field and the IMF link up, as noted below. South-pointing IMF lines open a door through which energy from the solar wind can reach Earth's inner magnetosphere. Also, the Sun's rotation axis is tilted 7 degrees with respect to the plane of Earth's orbit. Because the solar wind blows more rapidly from the Sun's poles than from its equator, the average speed of particles buffeting Earth's magnetosphere waxes and wanes every six months. The solar wind speed is greatest (by about 50 km/s, on average) around September 5 and March 5, when Earth lies at its highest heliographic latitude. Still, neither the IMF lines nor the solar wind can fully explain the seasonal behavior of geomagnetic storms. Those factors together contribute only about one-third of the observed semiannual variation. The auroral events that occurred as a result of the "great geomagnetic storm" on both August 28 and September 2, 1859, are thought to be perhaps the most spectacular ever witnessed in recent recorded history. The latter event, which occurred as a result of the exceptionally intense Carrington-Hodgson white light solar flare on September 1, produced auroras so widespread and extraordinarily brilliant that they were seen and reported in published scientific measurements, ship's logs, and newspapers throughout the United States, Europe, Japan, and Australia. It was said in the New York Times that "ordinary print could be read by the light [of the aurora]." The aurora is thought to have been produced by one of the most intense coronal mass ejections in history, very near the maximum intensity that the sun is thought to be capable of producing. It is also noteworthy because it was the first time that the phenomena of auroral activity and electricity were unambiguously linked. This insight was made possible not only due to scientific magnetometer measurements of the era but also as a result of a significant portion of the 125,000 miles of telegraph lines then in service being significantly disrupted for many hours throughout the storm. Some telegraph lines, however, seem to have been of appropriate length and orientation to allow a current to be induced in them (due to Earth's severely fluctuating magnetosphere) and actually used for communication. The conversation was carried on for around two hours using no battery power at all and working solely with the current induced by the aurora. It was thought to have been the first time on record that more than a word or two were transmitted in such manner. From the work of Michael Faraday (1791-1867) around 1830, it has been known that if two electric conductors are immersed in a magnetic field and one moves relative to the other, while a closed electric circuit threads both conductors, then an electric current will arise in that circuit. Electric generators (dynamos) make use of this process, but the conductors can also be plasmas (ionized gases). Both the magnetosphere and the solar wind consist of plasmas, which can conduct electricity. Their relative motion should generate electric currents by "dynamo action." The process is hampered by the fact that plasmas conduct easily along magnetic field lines, but not so easily perpendicular to them. It is therefore important that a temporary magnetic interconnection be established between the field lines of the solar wind and those of the magnetosphere, by a process known as magnetic reconnection. It happens most easily with a southward slant of IMF lines, because then field lines north of Earth approximately match the direction of field lines near the North Pole (namely, into the earth), and similarly near the southern pole. Indeed, active auroras are much more likely at such times. Electric currents originating in such fashion apparently give auroral electrons their energy. The magnetospheric plasma has an abundance of electrons: some are magnetically trapped, some reside in the magnetotail, and some exist in the upward extension of the ionosphere, which may extend (with diminishing density) some 25,000 km around the Earth. A dynamo mechanism is thought to provide a driving voltage for these currents on the order of 40,000 volts and up to 200,000 volts during magnetic storms. This voltage accelerates electrons to auroral energies and seems to be a major source for the formation of auroras. Other mechanisms have also been proposed. In particular, Alfvén waves—wave modes involving the magnetic field first noted by Hannes Alfvén (1908-1995)—have been observed in the lab and in space. Auroras can also be understood as being caused by the collision of charged particles (such as electrons) found in the magnetosphere with atoms in the Earth's upper atmosphere (at altitudes above 80 km). These charged particles are typically energized to levels between 1,000 and 15,000 electronvolts and, as they collide with atoms of gases in the atmosphere, the atoms become energized. Shortly afterward, the atoms emit their gained energy as light (see Fluorescence). Light emitted by the aurora tends to be dominated by emissions from atomic oxygen, resulting in a greenish glow (at a wavelength of 557.7 nm) and—especially at lower energy levels and higher altitudes—a dark-red glow (at 630.0 nm wavelength). Both these represent forbidden transitions of electrons of atomic oxygen that (in the absence of newer collisions) persist for a long time and account for the relatively slow (0.5-1 s) brightening and fading of auroral rays. Many other colors—especially those emitted by atomic and molecular nitrogen (blue and purple, respectively)—can also be observed. These, however, vary much faster and reveal the truly dynamic nature of auroras. Besides emitting visible light, auroras emit infrared (NIR and IR) and ultraviolet (UV) radiation and X rays. The visible light of auroras can be easily seen from Earth, but the UV and X-ray emissions are best seen from space, as the Earth's atmosphere tends to absorb and attenuate these emissions. 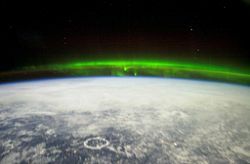 The Aurora Borealis as viewed from the International Space Station Expedition 6 team. In addition, the aurora and associated currents produce a strong radio emission around 150 kHz, known as the "auroral kilometric radiation" (AKR), discovered in 1972. Ionospheric absorption makes AKR observable only from space. Other processes are also involved in the aurora, and much remains to be learned. Auroral electrons created by large geomagnetic storms often seem to have energies below 1 keV and are stopped higher up, near 200 km. Such low energies excite mainly the red line of oxygen, so that often such auroras are red. On the other hand, positive ions also reach the ionosphere at such time, with energies of 20-30 keV, suggesting they might be an "overflow" along magnetic field lines of the copious "ring current" ions accelerated at such times, by processes different from the ones described above. 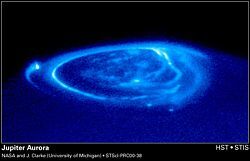 Jupiter aurora. The bright spot at far left is the end of field line to the moon Io; spots at bottom lead to the moons Ganymede and Europa. Both Jupiter and Saturn have magnetic fields much stronger than Earth's (Uranus, Neptune and Mercury are also magnetic), and both have large radiation belts. Auroras have been observed on both, most clearly with the Hubble space telescope. These auroras seem, like Earth's, to be powered by the solar wind. In addition, however, Jupiter's moons (especially Io) are also powerful sources of auroras. They arise from electric currents along field lines ("field aligned currents") generated by a dynamo mechanism, due to relative motion between the rotating planet and the moving moon. Io, which has active volcanism and an ionosphere, is a particularly strong source, and its currents also generate radio emissions, studied since 1955. Recently, an aurora was detected on Mars, although it was thought that the lack of a strong magnetic field would not make one possible. Of the several theories proposed to explain auroral events, the following are considered obsolete. Auroral electrons come from beams emitted by the Sun. This claim was made around 1900 by Kristian Birkeland, whose experiments in a vacuum chamber with electron beams and magnetized spheres (miniature models of the earth or "terrellas") showed that such electrons would be guided towards the polar regions. 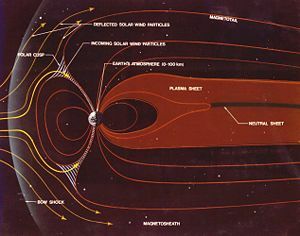 Problems with this model included absence of aurora at the poles themselves, self-dispersal of such beams by their negative charge, and more recently, lack of any observational evidence in space. The aurora is the overflow of the Van Allen radiation belt ("leaky bucket theory"). This was first disproved around 1962 by James Van Allen (1914-2006) and coworkers, who showed that the high rate at which energy was dissipated by the aurora would quickly drain all that was available in the radiation belt. Soon afterwards it became clear that most of the energy in trapped particles resided in positive ions, while auroral particles were almost always electrons, of relatively low energy. The aurora is produced by solar wind particles guided by the Earth's field lines to the top of the atmosphere. This holds true for the "cusp" aurora, but outside the cusp, the solar wind has no direct access. In addition, the main energy in the solar wind resides in positive ions; electrons have only about 0.5 eV (electron volt), and while in the cusp this may be raised to 50–100 eV, that still falls short of auroral energies. Images of auroras are significantly more common today, given the rise in digital camera use with high enough sensitivities. Film and digital exposure to auroral displays is fraught with many difficulties, particularly if faithfulness of reproduction is an important objective. Due to the different spectral energies present, and changing dynamically throughout the exposure, the results are somewhat unpredictable. Different layers of the film emulsion respond differently to lower light levels, and choice of film can be very important. Longer exposures aggregate the rapidly changing energy and often blanket the dynamic attribute of a display. Higher sensitivity creates issues of graininess. David Malin pioneered multiple exposure using multiple filters for astronomical photography, recombining the images in the laboratory to recreate the visual display more accurately. For scientific research, proxies are often used, such as ultraviolet, and re-colored to simulate the appearance to humans. Predictive techniques are also used, to indicate the extent of the display, a highly useful tool for aurora hunters. Terrestrial features often find their way into aurora images, making them more accessible and more likely to be published by major Web sites. An old Norse account of the northern lights is found in the Norwegian chronicle Konungs Skuggsjá from 1250 C.E. The chronicler has heard about this phenomenon from compatriots returning from Greenland, and he gives three possible explanations: that the ocean was surrounded by vast fires, that the sun flares could reach around the world to its night side, or that glaciers could store energy so that they eventually became fluorescent. An early Scandinavian name for northern lights translates as "herring flash." It was believed that northern lights were the reflections cast by large swarms of herring onto the sky. Another Scandinavian source refers to "the fires that surround the North and South edges of the world." This has been put forward as evidence that the Norse ventured as far as Antarctica, although this is insufficient to form a solid conclusion. The Finnish name for northern lights is revontulet, meaning "fox fires." According to legend, foxes made of fire lived in Lapland, and revontulet were the sparks they whisked up into the atmosphere with their tails. In Estonian, they are called virmalised, spirit beings of higher realms. The Sami people believed that one should be particularly careful and quiet when observed by the northern lights (called guovssahasat in Northern Sami). Mocking the northern lights or singing about them was believed to be particularly dangerous and could cause the lights to descend on the mocker and kill him. In Inuit folklore, northern lights were the spirits of the dead playing football with human skulls over the sky. They also used the aurora to get their children home after dark by claiming that if you whistled in their presence they would come down and split their heads from their body to play football with it. In Latvian folklore, northern lights, especially if red and observed in winter, are believed to be fighting souls of dead warriors, an omen foretelling disaster (especially war or famine). 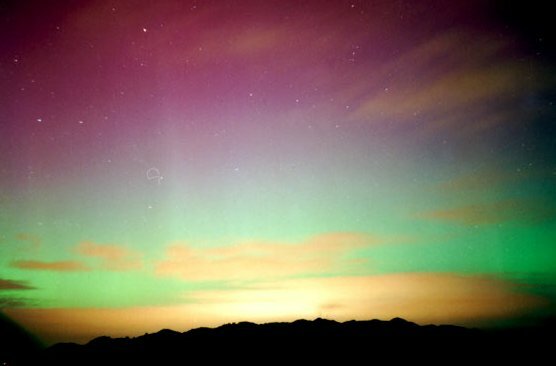 In Scotland, the northern lights were known as "the merry dancers" or na fir-chlis. There are many old sayings about them, including the Scottish Gaelic proverb "When the merry dancers play, they are like to slay." The playfulness of the merry dancers was supposed to end occasionally in quite a serious fight, and next morning when children saw patches of red lichen on the stones, they say amongst themselves that "the merry dancers bled each other last night." The appearance of these lights in the sky was considered a sign of the approach of unsettled weather. ↑ Kristian Birkeland. 1908. "The Norwegian Aurora Polaris Expedition 1902-3." ↑ Fritz, Hermann. 1881. "Das Polarlicht." ↑ Y. Feldshtein. 1963. "Some problems concerning the morphology of auroras and magnetic disturbances at high latitudes" Geomagnetism and Aeronomy, Vol. 3, 183-192. ↑ a numerical simulation of the solar wind illustrates the skew: Solar wind forecast.Geophysical Institute, University of Alaska, Fairbanks.Retrieved March 8, 2008. ↑ It is possible, however, that this approach might just be a different way of looking at the above process, because it does not point out a different energy source, and many plasma bulk phenomena can also be described in terms of Alfvén waves. ↑ Aurora ColorsRetrieved March 8, 2008. ↑ Mars Aurora.www.universetoday.com.Retrieved March 8, 2008. ↑ It is possible to take excellent images with standard film (employing ISO ratings between 100 and 400) and a single-lens reflex camera with full aperture, a fast lens (f1.4 50mm, for example), and exposures between 10 and 30 seconds, depending on the aurora's display strength. 2001 image.www.spaceweather.com. Retrieved March 8, 2008. ↑ Beliefs in Ancient Times www.quasar.irf.se. Retrieved March 8, 2008. Akasofu, Syun-Ichi. 2002. Secrets of the Aurora Borealis. Alaska Geographic Series, Vol. 1 29 (1). Eather, Robert H. 1980. Majestic Lights: The Aurora in Science, History, and the Arts. Washington, DC: American Geophysical Union. ISBN 0875902154. Phillips, Tony. 2001. 'tis the Season for Auroras. NASA. Retrieved January 15, 2007. Savage, Candace Sherk. 2001. Aurora: The Mysterious Northern Lights. Firefly Books. ISBN 1552095835. Stern, David P. 2002. Secrets of the Polar Aurora. Retrieved January 11, 2007. Stern, David P. 2003. Exploration of the Earth's magnetosphere. Retrieved January 11, 2007. 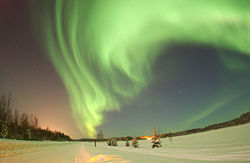 Aurora Acoustics Study of Sounds & Acoustical Effects Related to Geomagnetic Storms and Aurora Borealis. This page was last modified on 2 May 2016, at 22:10.